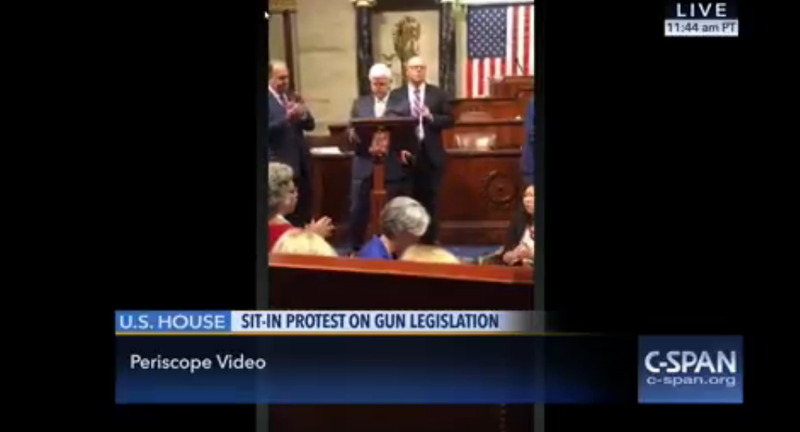 This morning, House Democrats, led by Rep. John Lewis (D-GA), staged a sit-in to force a vote on gun control. Almost immediately after, the cameras and microphones of C-SPAN—which typically broadcasts the action happening on the Senate and House floors—went off. But the network found a workaround: Periscope. As it turns out, the network doesn’t control what its cameras and microphones do—that’s the job of the House. As USA Today explains, the policy is such that the broadcast only runs while the House is in session. When Democrats refused to stop their protest, Rep. Ted Poe, (R-TX), who was presiding over the chamber, declared the House in recess—hence the camera shutdown. Not to be deterred, however, C-SPAN began using what appears to be the Periscope feed of Rep. Scott Peters (D-CA), who had been broadcasting the sit-in from his own account. Now, when you tune into C-SPAN, you’ll see vertical video of various speakers addressing the assembled group. Update 3:25 p.m.: Howard Mortman, C-SPAN’s director of communications, confirmed that this was the network’s first extended Periscope broadcast. “We’ve incorporated Periscope before as needed, for event coverage, to add color,” he told Gizmodo, but this was the “first continuous use of Periscope.” As for the camera shutdown, Mortman said that the network had asked for independent control before, but had been denied. “We’ve had this request pending for a long time. Both parties, both chambers have said no to it over the years,” he added. Update 3:50 p.m.: Unfortunately for Periscope, C-SPAN now looks to be using Facebook Live to broadcast the sit-in.